A special invitation from Bishop John: Monasticism – the "very soul of the … church"
It is clear to me that the Eparchy of Parma needs the witness, example and service that only well-established and vibrant monasticism can give. 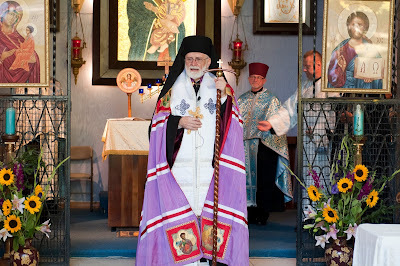 This eparchy is the only one in our Byzantine-Ruthenian Catholic Church without a men’s monastery/community. Our women’s monasteries/communities, because of their charism or because of the advanced age of the nuns, are restricted to a ministry of prayer. Although we are blessed with the (greatly appreciated) apostolic activity of monastics from outside the eparchy, their participation in the life of this eparchy is understandably limited. Pope John Paul II’s apostolic letter "Orientale Lumen" ("The Light of the East") devotes considerable attention to monasticism as a necessary "reference point for all the baptized" (9). 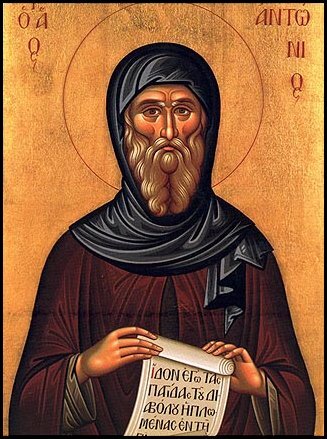 He states that monasticism is the "very soul of the … church" (9) [All such numbers are references to "Orientale Lumen"]. We cannot deny the blessings of monastic experience, past and present, here and elsewhere in our church, but we must be open to re-visioning. This may take the form of extending a present experience or taking a totally new approach. I envision either a men’s or women’s monastery, or both, that will be based on the spirit of "Orientale Lumen." 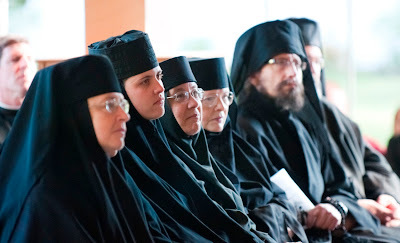 We must take advantage of the "extraordinary flexibility" of Eastern monasticism to "personalize (it to) the times, rhythms and ways of seeking God … to fulfill the expectations of (this particular) church in (this) period of its history" (13). I am sharing this communication with you because of either your experience in monasticism or your possible interest in participating in such a venture. Please feel free to share this with anyone else who may share our interest. I would appreciate your comments or questions that may help in further consideration. We would also appreciate your prayer. The monastery will be Byzantine and Catholic in its common spirituality, taking leadership "to rediscover [our] full identity … according to [our] own special disciplines. …" (21). The monastery will follow the Byzantine tradition as it is known by those churches who trace their roots to the Eparchy of Mukacevo, and further to Constantinople. The monastery will provide an environment where the monastics may live the Christian life, "intensely and exclusively" (9). The monastics will not be substitutes for the holiness of the rest of us but will "witness to the fact that we Christians are at different stages of the spiritual journey," inviting all to a deeper spirituality (9). "Concretely lived charity (will be) the basis" for interpersonal relationship (9). 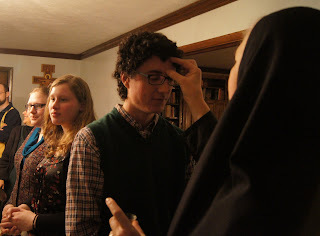 Living "suspended between … the Word of God and the Eucharist," the monastics will realize their call is both "individual and, at the same time, an ecclesial and community event" (10). A structure of authority will be developed to allow for "obedience as the listening which changes life" (10). Communal prayer will be adequate to "assimilate the Word through chanting" (10). The Mukacevo plainchant (prostopinije) will be the norm. The monastics will share their goods in a way to "proclaim the awareness of one’s own radical poverty" (10). There will be a regular celebration of the Holy Eucharist, in its fullness, as "the culmination of their prayer experience … the Word becomes Flesh and Blood" (10). The monastics will draw the strength of their community from the Holy Eucharist, by which they realize that they are "‘kinsmen" of Christ, anticipating the experience of divinization" (10). Efforts will be taken to develop into "a living sign of the expectation of (divinization)" (10). A respect for the matter of creation will be demonstrated by the sanctification of time and of that which is entrusted to the monastery (11). The monastics will engage in on-going formation for "spiritual discernment in continuous purification," especially strengthened by prayer and fasting (11). They shall engage in study to "contemplate Christ in the hidden recesses of creation and in the history of humankind … seeking the meaning of life" (12) and to provide the church at large with inspiration to respond to the needs of the moment (14). The model of the "spiritual father" will be followed in the on-going formation of the monastics. The monastics will be encouraged to develop this model in their own lives for others, as well (13). The monastics will build a communal dimension by (a) opportunities for developing spiritual friendships ("koinonia"); (b) a communal service/ministry ("diakonia"); (c) preaching, teaching, writing to proclaim the Christian message ("kerygma"); and (d) communal worship ("eucharistia") (Cf. 10 and 14). Although living in community will be the norm for the monastics, an option will be available for those who must, at least for a time, live separately. A structure will be established to maintain participation in the community. Efforts will be taken to integrate learning and participation into a single reality, as Jesus Christ is the Truth and the Life – but also the Way (15). The monastics will have adequate time for silence, to courageously meet one’s self, without the deafening of noise. This will provide time for a "prayerful assimilation of scripture and the liturgy more than by systematic meditation" (16). The monastery will be a center for evangelization and ecumenism, reaching out to both Eastern and Western churches, and to all (2, 3). The monastery will be a place of pilgrimage and retreat. Hospitality will be an important characteristic of the community. The monastics will be expected to share the fruits of their spiritual discipline with the church at large, both with the hierarchy and with individual seekers. Initially at least, the bishop will maintain supervision of the monastery and will participate, on a limited basis, in the life of a men’s monastery. Priest-monks must be incardinated into the Eparchy of Parma or given leave from their own eparchy or religious order. Initially, all monastics will maintain ownership of their personal property but use thereof and purchases will be subject to monastic authority. Initially, all property of the monastery will be owned by the Eparchy and the Eparchy will assist the monastery financially. With time, the monastery will be self-sufficient. A uniform attire will be expected for church and formal community activities. New members of the monastery will be admitted according to the same process as those who seek admission to the Eparchy of Parma formation program toward ordination, although acceptance criteria will correspond to the monastic vocation. Stages of formation will be immediately established. Any or all of the above may change, subject to the inspiration of the Holy Spirit. Email sent to the Eparchy’s Office of Communications, viscom@parma.org, will be forwarded to me. The highly anticipated episode 2 is now here! Enjoy! In this episode, the Sisters interview Subdeacon Andrew Summerson about his experiences as a seminarian studying in Rome and his advice for young people who are discerning their vocations. They also introduce a new "special segment": Helpful Hints from Handy Gabriella! You will also hear some words of wisdom from this episode's "sponsor," Venerable Archbishop Fulton J. Sheen. 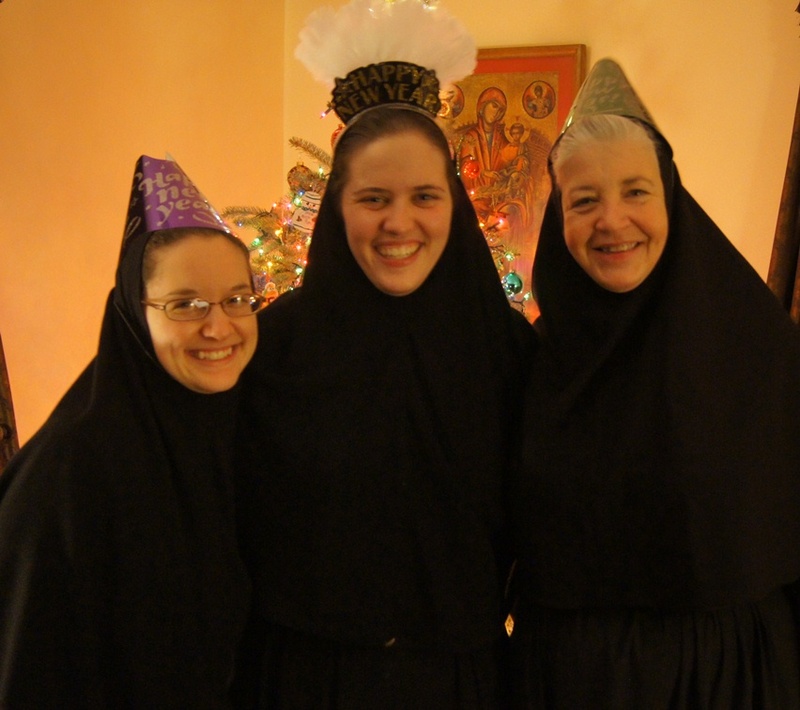 We are having our 2nd Annual Monastery Teen Girls' Sleepover on Saturday, February 2nd to Sunday, February 3rd! Click here for the online registration! Check out and join our Facebook event if you plan to register! Be sure to register AS SOON AS POSSIBLE because we only have space for 20 teens. Registration is due by Tuesday, January 29th! "The waters beheld You and they trembled"
Happy Feast of the Theophany! "The waters beheld You, O Lord; the waters beheld You and they trembled. The river Jordan turns back on its course as it beholds the fire of the Godhead coming down upon it and entering it in the flesh. The river Jordan turns back in its course as it beholds the Holy Spirit descending in the likeness of a dove, and hovering over you. The river Jordan turns back in its course as it beholds the Invisible made visible, the Creator existing in the flesh, and the Master in the likeness of a servant. The river Jordan turns back in its course, and the mountains leap for joy as they behold God in the flesh. And the clouds give voice and are filled with awe by the One who is coming, Light of Light, true God of true God; the One who, in the river Jordan, has drowned to death sin, the thorn of error, and the bonds of hell, and granted the baptism of salvation to the world" (From the Great Blessing of Water). A group of young adults joined us to celebrate the Vigil of Theophany (the Baptism of Our Lord) this weekend. The highlight of the weekend was the three-hour service on Saturday afternoon that included vespers, the Divine Liturgy of St. Basil, the Great Blessing of Water and the blessing of our monastery and our pond. It was a marathon of prayer! (But it really didn't feel like three hours!) 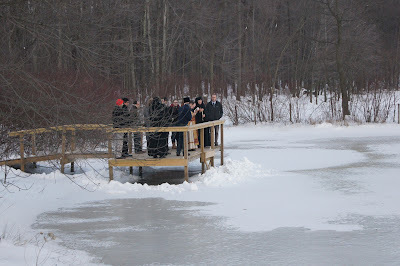 Earlier in the day, two of the young adults went out and made a hole in the ice on the pond so that the priest could drop the cross in the water, as is tradition! (It is also tradition that someone dives in and retrieves the cross...we didn't participate in that part of the tradition!) After the service, we enjoyed the traditional Velija (Vigil) Supper which is similar to the supper on Christmas Eve. It was fun to share the traditions (and delicious food) of this supper with our guests, several of whom have never experienced it. Please enjoy this photo album from the Feast! And remember to "like" our page on Facebook so that you can view more photos and quotes as we post them! 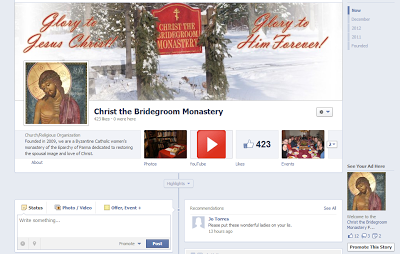 We are proud to present our new Facebook Page, which we launched yesterday afternoon. Thanks to the help of an Imagine Sisters shout out, we already have over 400 'likes' on our page! Please continue to share our page, or 'like' it if you have not already, and be sure to check back for updates, events, blog posts, videos, photos and more! Also be sure to check out Imagine Sisters and 'like' them as well. They are a newly-emerging social media and campus-based campaign that is doing a lot of great work to inspire young women to imagine what it could be like to give their life to the Lord as women religious. A major reason for our new endeavor on Facebook is to further respond to Blessed John Paul II's call to participate in a 'new evangelization,' specifically through the use of the internet, as a way of further communicating Christ's love and teachings. Please see the following paragraph from the Introduction to our Typikon (rule of life), where we explain our use of technology. 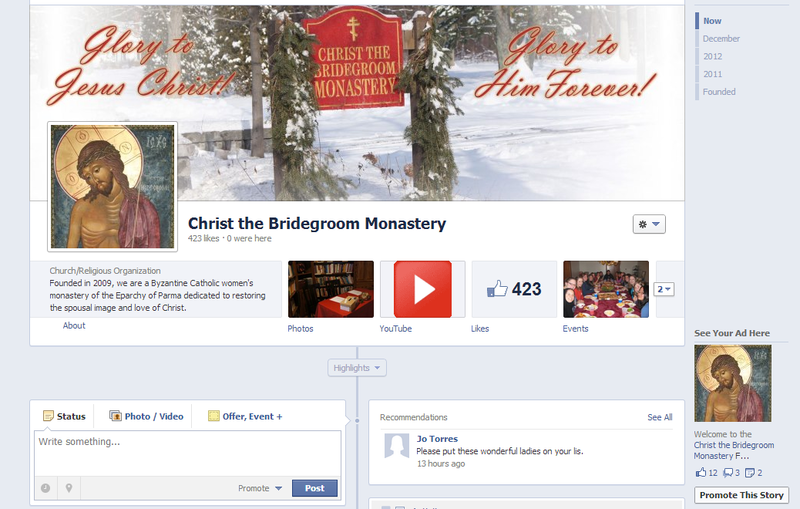 "The monastery is 'new in methods,' utilizing modern technology to proclaim the life-giving truths of the Gospel. While not becoming 'of the world,' we desire to creatively engage those in the world through contemporary methods of communication, particularly through the internet, in order to reach others with the message of Jesus Christ. In a spirit of Christian temperance, our use of modern technology will be limited for our spiritual well-being and to show others the joyful freedom of such limits." Happy New Year! We're kicking off the new year with a new look for our website! We hope you enjoy the updated design! In the meantime, prepare with us for the awesome Feast of the Theophany of Our Lord, coming up this Sunday! p.s. Fun fact about our new website design: The font for the titles of our posts is called "Covered By Your Grace!"